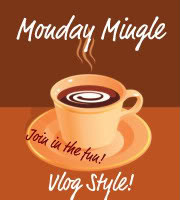 Welcome to Monday Mingle for August 31st 2009! If you'd like to join in the fun, do a short vlog on your blog, post the above button on your site and link up on the linky at Eighty MPH Mom. Visit the other participants, learn about them and have fun! Trust me, if I can do it, then you can. Look down there at the amateur :) Come on jump in! I'm also the Sunday featured blogger on Jennifer's blog so stop by and you'll learn a bit more about me. Ask me any questions you like. Thank you loves for such kind comments. You have no idea how boosting they are to one who struggles with self esteem. Another reason why I challenged myself to do these vlogs. Thanks for visiting with me and I'll come visit soon. Hello! You did a wonderful job as usual! Thanks for the shout out - you are too sweet! You are not alone in watching your kids so carefully - I have always done that too. Everyone calls me overprotective, but the way I see it is you have one chance to do it right...right? Congrats on your $100 - that is awesome! It will be interesting to see next week's mingles - with the questions. I can't wait! I hope that you can get the steam mop you want. A $100 that is awesome!! I gave up potty training my three year old too. And she doesn't care either. It is so frustrating. I am just going to let it happen like you do. But I am so sick of poopy diaper changes! I'm still waiting on the steam mop. I'm not even excited just in case something happened to it and it has to be returned and delay my cleaning pleasure. You understand my frustration with the potty training. I'm really sick of poopy diapers and if the dh helped with that ever so often, I might not feel so frustrated about it all. I try to relax and tell myself it's not a big deal now though so that I don't stress too much. I hope your daughter will begin to show interests soon so you can start again. I absolutely adore you! I love your smile, it makes me smile big smiles! You and you alone know what is right for your kiddos, like you said you've got time. Congratulations on the WIN! $100 GC is a very big deal! I'm sure you will work it out something for mommy and something for the kiddos! WHOOOOHOOOOOO so glad you won. I can't wait to see you next week - I adore you I do. Oh I don't blame you for keeping a close eye on your kids... I do the same. Congrats on your win :) Gotta love an extra $100, it comes in handy. I'm sure that your daughter will get back on the potty train wagon soon -- in her own time. I think you did the right thing by waiting for now. You're a good momma!! You had such a nice feature yesterday! I enjoyed reading about you! You're probably wise to just relax and wait for your daughter to be ready for potty training. I'm just seeing this. It's like a good dessert at the end of the day. Thank you for such kind words. It is such a relief to put the potty training on hold. I can tell she was getting distressed and so was I because I couldn't' understand such a smart little one not understanding what to do. And then I re-evaluate the whole situation. I am sure you would enjoy my blogs, so I would love it if you would follow! Hope you are having a fabu week!